The Janvier family thinks they are doing their niece Tally a favor by temporarily caring for her when she has nowhere else to go. Who knew they needed Tally just as much as she needed them? This is a story about families, the walls we build around ourselves, and healing. Susan Meissner is one of my favorite authors and this book is every bit of what you would expect from her. She weaves several storylines throughout the book, which can seem daunting at first, but she ties them up quite neatly at the end. I had a bit of trouble keeping up with everything that was going on at times, but am so glad I saw this book through to the end. It was very good and I recommend it. 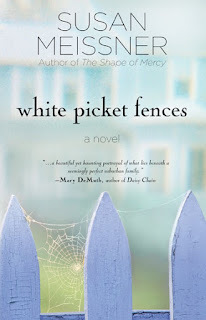 You can purchase a copy of White Picket Fences here. I have a copy of this wonderful novel to give away to one lucky reader. To win, simply follow me on Twitter and tweet about the giveaway. Deadline to enter is 11/16/09 at 11;59pm CST. Ramblings of a Texas Housewife Product Review and/or Giveaway Disclosure- I have received no compensation from WaterBrook Multnomah Publishing Group other than the offer of free product to review and/or giveaway. Any opinions expressed on Ramblings of a Texas Housewife are my own. My reviews are never reviewed or edited in any way by sponsors. I'm following on Twitter and twittered about your give away under onedesertrose. This sounds like such a great reconciliation book from the review. Thanks for the chance! Love the blog! Id love to read this book! Sounds really good! I am not sure if you really want a comment or just a tweet so I did both:) Thanks. Please pick me for this great giveaway, sounds like an Awesome book!